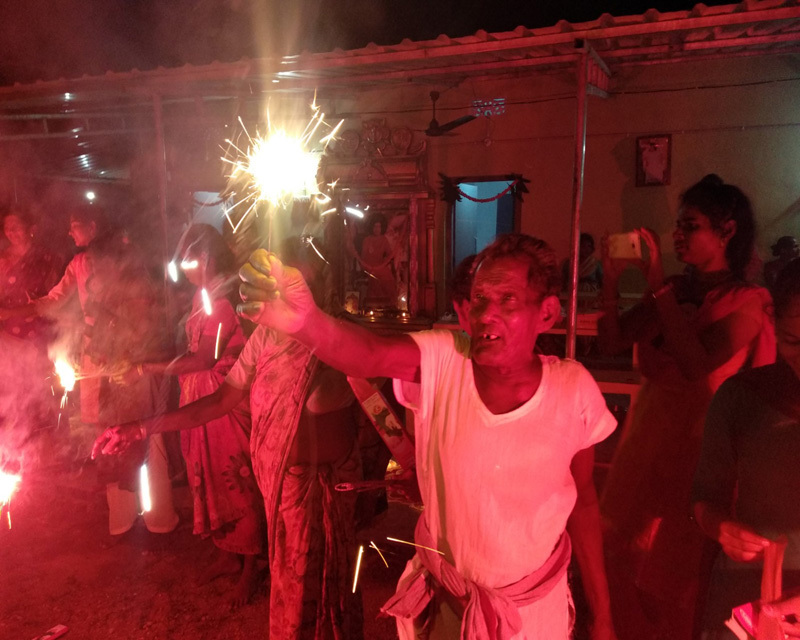 06 Nov 2018 Lalitha Devi Oldage Home, Appalarajupuram, Cheedikada and Loyola Old age Home, Pendurthi. 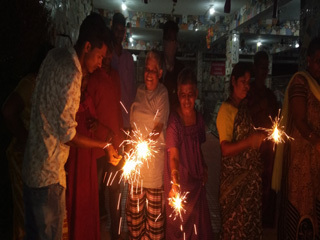 A novel idea to celebrate Deepawali festivities with the inmates of Lalitha Devi Oldage Home at Appalarajapuram and Loyola Oldage Home at Pendurthi has continued this year as well. 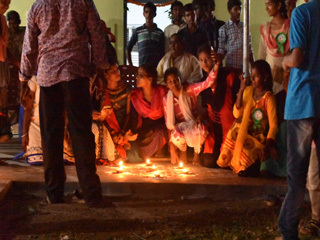 Uniqueness of this year's celebration included an open invitation given to our donors/well-wishers, etc. to participate in the event. 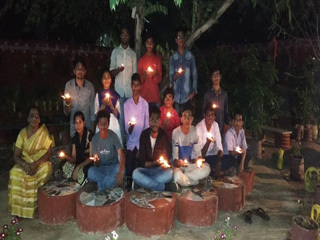 We were able to motivate the parents of some of the scholars to partake in this year Deepawali celebration. In total, 78 scholars both from rural and urban areas have actively participated in the event. We were able to celebrate the day with 118 inmates spread across both the oldage homes. 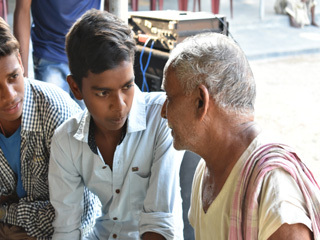 With detailed preparations made by the scholars in the first half of the day, the teams left to the respective Old age homes. With the entry of scholars/students in the oldage home, the homes breathed a new life. The scholars decorated the premises with flowers and made ready for the event. 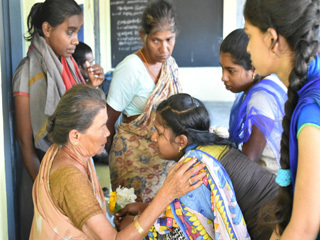 Subsequently they interacted with the inmates, tried to understand their feelings. A storm of emotions ran past the young and tender minds. They were able to empathise with the inmates condition of life. As they got more acquainted with the surroundings, they were able to bring all the inmates to a common gathering place. With this the celebration mood has kicked in every one were in a festive mood. Cultural performance like kolatam, dhimasa, performance of violin, antyakshari (song competition), etc. were performed by the young scholars. The inmates were really enthralled by the performance which made them to dance as well. Some of the old women sang songs. 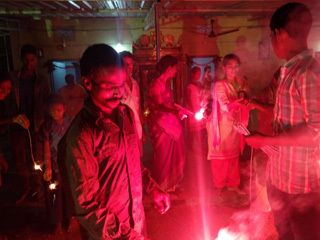 Later the time has come for the people present to offer prayers and celebrate the day with bursting of the crackers. 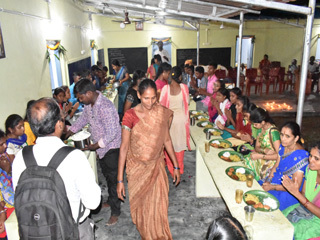 Finally, the day came to an end with a sumptuous meal served to the inmates and a sense of satisfaction on every face.